For other uses, see Tora Tora Tora (disambiguation). Tora! Tora! Tora! (Japanese: トラ・トラ・トラ) is a 1970 Japanese-American biographical war drama film that dramatizes the Japanese attack on Pearl Harbor in 1941. The film was directed by Richard Fleischer, Toshio Masuda and Kinji Fukasaku, and stars an ensemble cast including Martin Balsam, Joseph Cotten, Sō Yamamura, E. G. Marshall, James Whitmore and Jason Robards. The tora of the title is the two-syllable Japanese codeword used to indicate that complete surprise had been achieved. Japanese being a language with many homophones, it is a coincidence that tora also means "tiger" (虎). In August 1939, a trade embargo imposed by the United States is depriving a belligerent Japan of raw materials. Influential army figures and politicians push through an alliance with Germany and Italy in September 1940 and make preparations for war. The newly appointed Commander-in-Chief of the Combined Fleet Admiral Isoroku Yamamoto reluctantly orders the planning of a pre-emptive strike on the U.S. Pacific Fleet anchored at Pearl Harbor, believing that Japan's best hope of achieving control of the Pacific Ocean is to annihilate the fleet at the outset of hostilities. Air Staff Officer Minoru Genda is chosen to mastermind the operation while his old Naval Academy classmate Mitsuo Fuchida is selected to lead the attack. Meanwhile, in Washington, U.S. military intelligence has managed to break the Japanese Purple Code, allowing the U.S. to intercept secret Japanese radio transmissions indicating increased Japanese naval activity. Monitoring the transmissions are U.S. Army Col. Bratton and U.S. Navy Lt. Commander Kramer. At Pearl Harbor itself, Admiral Kimmel and General Short do their best to enhance defenses by increasing naval and aerial patrols around Hawaii to provide early warning of any enemy presence. Short recommends parking all aircraft at the base on the runways to avoid sabotage by enemy agents. Several months pass with diplomatic tensions continuing to escalate. As the Japanese ambassador continues negotiations to stall for time, the Japanese fleet sorties into the Pacific and soon is in position to begin the assault. On the day of the attack, Bratton and Kramer learn from intercepts that the Japanese plan to commence a series of 14 radio messages from Tokyo to the Japanese embassy in Washington with an instruction to destroy their code machines after receiving the final message. Deducing that the Japanese plan to launch a surprise attack after the messages are delivered, Bratton attempts to warn his superiors of his suspicions but encounters several obstacles – Chief of Naval Operations Harold R. Stark is indecisive over notifying Hawaii without first alerting the President while Army Chief of Staff General George Marshall's order that Pearl Harbor be alerted of an impending attack is stymied by poor atmospherics that prevent radio transmission and bungling when a warning sent by telegram is not marked urgent. At dawn on December 7, the Japanese fleet launches its aircraft. Their approach to Hawaii is detected by two radar operators but their concerns are dismissed by the duty officer receiving their alert. The Japanese thus achieve complete surprise and a joyous commander Fuchida sends the code to begin the attack: "Tora! Tora! Tora!" The damage to the naval base is catastrophic with the U.S. suffering severe casualties. Seven battleships are either sunk or heavily damaged. General Short's anti-sabotage precautions prove a disastrous mistake that allows the Japanese aerial forces to destroy the U.S. aircraft on the ground with ease. Hours after the attack is over, General Short and Admiral Kimmel finally receive Marshall's telegram warning of impending danger. In Washington, the Secretary of State Cordell Hull is stunned on learning of the attack and urgently requests confirmation before receiving the Japanese ambassador. The message that was transmitted to the Japanese embassy in 14 parts – a declaration of war – was meant to be delivered to the U.S. at 1:00 pm in Washington, 30 minutes before the attack. However, it was not decoded and transcribed in time, with the result that the attack took place while the two nations were technically still at peace. The distraught Japanese ambassador, helpless to explain the late ultimatum and unaware of the ongoing attack, is bluntly rebuffed by a despondent Hull. Back in the Pacific, the Japanese fleet commander, Vice-Admiral Chūichi Nagumo, refuses to launch the scheduled third wave of aircraft for fear of exposing his force to U.S. submarines. Aboard his flagship, Admiral Yamamoto solemnly informs his staff that their primary targets – the U.S. fleet's aircraft carriers, which had been dispatched into the Pacific days previously to search for Japanese vessels – were not at Pearl Harbor and thus escaped unscathed before lamenting the fact that the declaration of war was not received until after the attack began. Noting that nothing would infuriate the U.S. more he concludes, "I fear all we have done is to awaken a sleeping giant and fill him with a terrible resolve." The North American T-6 Texan stood in for the Mitsubishi A6M Zero as there were no airworthy types at that time. Only Zeros from the carrier Akagi were depicted, identifiable by the single red band on the rear fuselage. Aichi D3A replica at the Geneseo Airshow. In 1968 a Vultee BT-13 Valiant (N56867) was converted to a Val replica for use in the filming of the movie Tora! Tora! Tora!, flown as Val "AI-244" from the carrier Akagi. A number of Curtiss P-40 Warhawk mockups were blown up during filming. This example, which was spared destruction, is currently on display at Wheeler Army Airfield, with markings identical to those of 2nd Lt George Welch. Replica models like this ​1⁄15 scale USS Nevada were used for the overhead shots of Battleship Row. The model survives today in Los Angeles and often appears at local parades. Veteran 20th Century Fox executive Darryl F. Zanuck, who had earlier produced The Longest Day (1962), wanted to create an epic that depicted what "really happened on December 7, 1941", with a "revisionist's approach". He believed that the commanders in Hawaii, General Short and Admiral Kimmel, though scapegoated for decades, provided adequate defensive measures for the apparent threats, including relocation of the fighter aircraft at Pearl Harbor to the middle of the base, in response to fears of sabotage from local Japanese. Despite a breakthrough in intelligence, they had received limited warning of the increasing risk of aerial attack. Recognizing that a balanced and objective recounting was necessary, Zanuck developed an American-Japanese co-production, allowing for "a point of view from both nations". He was helped out by his son, Richard D. Zanuck, who was chief executive at Fox during this time. Production on Tora! Tora! Tora! took three years to plan and prepare for the eight months of principal photography. The film was created in two separate productions, one based in the United States, directed by Richard Fleischer, and one based in Japan. The Japanese side was initially to be directed by Akira Kurosawa, who worked on script development and pre-production for two years. But after two weeks of shooting, he was replaced by Toshio Masuda and Kinji Fukasaku, who directed the Japanese sections. Well, I always thought that even though Kurosawa was a genius at film making and indeed he was, I sincerely believe that he was miscast for this film, this was not his type of film to make, he never made anything like it and it just wasn't his style. I felt he was not only uncomfortable directing this kind of movie but also he wasn't used to having somebody tell him how he should make his film. He always had complete autonomy, and nobody would dare make a suggestion to Kurosawa about the budget, or shooting schedule, or anything like that. And then here he was, with Darryl Zanuck on his back and Richard Zanuck on him and Elmo Williams and the production managers, and it was all stuff that he never had run into before, because he was always untouchable. I think he was getting more and more nervous and more insecure about how he was going to work on this film. And of course, the press got a hold of a lot of this unrest on the set and they made a lot out of that in Japan, and it was more pressure on him, and he wasn't used to that kind of pressure. Larry Forrester and frequent Kurosawa collaborators Hideo Oguni and Ryūzō Kikushima wrote the screenplay, based on books written by Ladislas Farago and Gordon Prange of the University of Maryland, who served as a technical consultant. Numerous technical advisors on both sides, some of whom had participated in the battle and/or planning, were crucial in maintaining the accuracy of the film. Minoru Genda, the man who largely planned and led the attack on Pearl Harbor was an uncredited technical advisor for the film. Four cinematographers were involved in the main photography: Charles F. Wheeler, Sinsaku Himeda, Masamichi Satoh, and Osami Furuya. They were jointly nominated for the Academy Award for Best Cinematography. A number of well-known cameramen also worked on the second units without credit, including Thomas Del Ruth and Rexford Metz. The second unit doing miniature photography was directed by Ray Kellogg, while the second unit doing aerial sequences was directed by Robert Enrietto. Noted composer Jerry Goldsmith composed the film score and Robert McCall painted several scenes for various posters of the film. The carrier entering Pearl Harbor towards the end of the film was in fact the Iwo Jima-class amphibious assault ship USS Tripoli, returning to port. The "Japanese" aircraft carrier was the anti-submarine carrier USS Yorktown. The Japanese A6M Zero fighters, and somewhat longer "Kate" torpedo bombers or "Val" dive bombers were heavily modified Royal Canadian Air Force Harvard (T-6 Texan) and BT-13 Valiant pilot training aircraft. The large fleet of Japanese aircraft was created by Lynn Garrison, a well-known aerial action coordinator, who produced a number of conversions. Garrison and Jack Canary coordinated the actual engineering work at facilities in the Los Angeles area. These aircraft still make appearances at air shows. For the parallel filming in Japan, full scale mock-ups of the Japanese Battleship Nagato and Aircraft Carrier Akagi were built from the waterline up on shore, with about 90 feet of their bows extending out over the ocean on stilts. These were used for much of the Japanese scenes on ship's decks. The one error introduced, however, was that Akagi's bridge was built on the Starboard side instead of the Port side. Only two Japanese carriers were built in this fashion, with bridges on the Port Side, Akagi and Hiryu. The reason this was done was because it was known that for the launching scenes filmed in the US, a US carrier would be used and the islands of US carriers were always on the Starboard side. A few of the modified aircraft were also converted in Japan for the flight scenes filmed there. In preparation for filming, Yorktown was berthed at NAS North Island in San Diego to load all the aircraft, maintenance, and film crew prior to sailing to Hawaii. The night before filming the "Japanese" take-off scenes she sailed to a spot a few miles west of San Diego and at dawn the film crew filmed the launches of all the aircraft. Since these "Japanese" aircraft were not actual carrier based aircraft they did not have arresting gear with which to land back on the carrier, and continued on to land at North Island Naval Air Station. Yorktown sailed back to North Island and re-loaded the aircraft. She then sailed to Hawaii and the aircraft were off-loaded and used to film the attack scenes in and around Pearl Harbor. Aircraft Specialties of Mesa, Arizona performed maintenance on the aircraft while in Hawaii. A Boeing B-17 Flying Fortress's actual crash landing during filming, a result of a jammed landing gear, was filmed and used in the final cut. The film crew received word that one of the B-17s could not lower their starboard landing gear so they quickly set up to film the "single gear" landing. The aircraft stayed aloft to use up as much fuel as possible, which gave the film crew some time to prepare, prior to landing. After viewing the "single gear" landing footage they decided to include it in the movie. In the sequence depicting the crash, only the final crash was actual footage. For the scenes leading up to the crash they manually retracted the starboard landing gear on a functioning B-17 and filmed the scenes of its final approach. After touching down on one wheel the pilot simply applied power and took off again. The B-17 that actually landed with one gear up sustained only minor damage to the starboard wing and propellers and was repaired and returned to service. A total of five Boeing B-17s were obtained for filming. Other U.S. aircraft used are the Consolidated PBY Catalina and, especially, the Curtiss P-40 Warhawk (two flyable examples were used). Predominantly, P-40 fighter aircraft are used to depict the U.S. defenders with a full-scale P-40 used as a template for fiberglass replicas (some with working engines and props) that were strafed and blown up during filming. Fleischer also said a scene involving a P-40 model crashing into the middle of a line of P-40s was unintended, as it was supposed to crash at the end of the line. The stuntmen involved in the scene were actually running for their lives. With over 30 aircraft in the air, the flying scenes were complex to shoot, and can be compared to the 1969 film Battle of Britain where large formations of period specific aircraft were filmed in staged aerial battles. The 2001 film Pearl Harbor would use some of the same modified aircraft. USS Yorktown during the filming of Tora! Tora! Tora!, 1968. Parts of the film showing the takeoff of the Japanese aircraft utilize an Essex-class aircraft carrier, Yorktown, which was commissioned in 1943 and modernized after the war to have a very slightly angled flight deck. 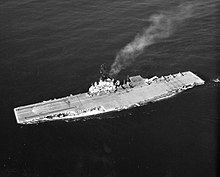 The ship was leased by the film producers, who needed an aircraft carrier for the film; and as Yorktown was scheduled to be decommissioned in 1970, the Navy made her available. She was used largely in the takeoff sequence of the Japanese attack aircraft. The sequence shows interchanging shots of models of the Japanese aircraft carriers and Yorktown. It does not look like any of the Japanese carriers involved in the attack, due to its large bridge island and its angled landing deck. The Japanese carriers had small bridge islands, and angled flight decks were not developed until after the war. In addition, during the scene in which Admiral Halsey is watching bombing practice an aircraft carrier with the hull number 14 is shown. Admiral Halsey was on USS Enterprise, not the Essex-class carrier USS Ticonderoga, which would not be commissioned until 1944. This is understandable, however, as both Enterprise and all six of the Japanese carriers from the attack had been scrapped and sunk, respectively. Enterprise was scrapped in 1959, and four of the six, including Akagi, were sunk within six months of the attack at the Battle of Midway. In Tora! Tora! Tora!, an error involves the model of Japanese aircraft carrier Akagi. In the film, Akagi's bridge island is positioned on the starboard side of the ship, which is typical on most aircraft carriers. However, the aircraft carrier Akagi was an exception; its bridge island was on the port side of the ship. Despite this, the bridge section appeared accurately as a mirrored version of Akagi's real port-side bridge. Secondly, all the Japanese aircraft in the footage bear the markings of Akagi's aircraft (a single vertical red stripe following the red sun symbol of Japan), even though five other aircraft carriers participated, each having its own markings. In addition, the markings do not display the aircraft's identification numbers as was the case in the actual battle. The white surround on the roundel on the Japanese aircraft was only used from 1942 onwards. Prior to this the roundel was red only. USS Ward (DD-139) was an old "4-piper" destroyer commissioned in 1918; the ship used in the movie, USS Finch (DE-328), which portrays Ward looked far different from the original destroyer. In addition, in the movie she fired two shots from her #1 gun turret. In reality, Ward fired the first shot from the #1 4-inch (102 mm) un-turreted gunmount and the second shot from the #3 wing mount. A stern section of USS Nevada was built that was also used to portray USS Arizona and other U.S. battleships. The lattice mast (or cage mast) section of the Tennessee-class/Maryland-class battleship was built beside the set of the USS Nevada stern section, but not built upon a set of a deck, but on the ground as the footage in the movie only showed the cage mast tower. The large scale model of the stern shows the two aft gun turrets with three gun barrels in each; in reality, Nevada had two heightened fore and aft turrets with two barrels each while the lower two turrets fore and aft had three barrels each. Another model of Nevada, used in the film to portray the whole ship, displays the turrets accurately. It should be noted that the reason for this anomaly is because the aft section model was used in the film to portray both USS Nevada and USS Arizona. The ships looked remarkably similar except that Arizona had four triple turrets and a slightly different stern section. Footage and photographs not used in the film show the cage mast as being built on the ground. The USS Nevada/USS Arizona stern section was shown exploding to represent the explosion that destroyed Arizona, although in reality the explosion took place in #2 magazine, forward, and Arizona's stern section remains essentially intact to this day. The film has a Japanese Zero fighter being damaged over a naval base and then deliberately crashing into a naval base hangar. This is actually a composite of three incidents at Pearl Harbor attack: in the first wave, a Japanese Zero crashed into Fort Kamehameha's ordnance building; in the second wave, a Japanese Zero did deliberately crash into a hillside after U.S. Navy CPO John William Finn at Naval Air Station at Kāneʻohe Bay had shot and damaged the aircraft; also during the second wave, a Japanese aircraft that was damaged crashed into the seaplane tender USS Curtiss. During a number of shots of the attack squadrons traversing across Oahu, a white cross can be seen standing on one of the mountainsides. The cross was actually erected after the attack as a memorial to the victims of the attack. In the final scene Admiral Isoroku Yamamoto says "I fear all we have done is to awaken a sleeping giant". An abridged version of the quotation is also featured in the 2001 film Pearl Harbor. Although the quotation may well have encapsulated many of his real feelings about the attack, there is no printed evidence to prove Yamamoto made this statement or wrote it down. At the time of its initial release, Tora! Tora! Tora! was thought to be a box office disappointment in North America, although its domestic box office of $29,548,291 made it the ninth highest-grossing film of 1970. It was a major hit in Japan and over the years, home media releases provided a larger overall profit. According to Fox records the film required $37,150,000 in rentals to break even and by 11 December 1970 had made $37,150,000 so it broke even. The Commemorative Air Force's Gulf Coast Wing's Tora! Tora! Tora! team still fly the movie's aircraft simulating the attack at airshows. Roger Ebert felt that Tora! Tora! Tora! was "one of the deadest, dullest blockbusters ever made" and suffered from not having "some characters to identify with." In addition, he criticized the film for poor acting and special effects in his 1970 review. Vincent Canby, reviewer for The New York Times, was similarly unimpressed, noting the film was "nothing less than a $25-million irrelevancy." Variety also found the film to be boring; however, the magazine praised the film's action sequences and production values. James Berardinelli, however, said it was "rare for a feature film to attain the trifecta of entertaining, informing, and educating." Charles Champlin in his review for the Los Angeles Times on September 23, 1970, considered the movie's chief virtues as a "spectacular", and the careful recreation of a historical event. Despite the initial negative reviews, the film was critically acclaimed for its vivid action scenes, and found favor with aviation and history aficionados. However, even the team of Jack Hardwick and Ed Schnepf who have been involved in research on aviation films, had relegated Tora! Tora! Tora! to the "also-ran" status, due to its slow-moving plotline. The film holds a 57% "Rotten" rating on the review aggregate website Rotten Tomatoes, based on 28 critical reviews. In 1994, a survey at the USS Arizona Memorial in Honolulu determined that for Americans the film was the most common source of popular knowledge about the Pearl Harbor attack. Several later films and TV series relating to World War II in the Pacific have used footage from Tora! Tora! Tora!. These productions include the films Midway (1976; in the Tora! Tora! Tora! DVD commentary, Fleischer is angry that Universal used the footage), All This and World War II (film 1976), Pearl (TV mini-series 1978), From Here to Eternity (TV mini-series 1979), The Final Countdown (1980), and Australia (2008) as well as the Magnum, P. I. television series episode titled "Lest We Forget" (first airdate February 12, 1981). Tora! Tora! Tora! was nominated for five Academy Awards, winning one for Visual Effects. Nominee Best Sound (Murray Spivack and Herman Lewis). ^ a b c Parish 1990, p. 411. ^ "Box Office Information for Tora! Tora! Tora!" The Numbers. Retrieved: January 9, 2012. ^ http://corp.dmm.com/, 株式会社DMM.com -. "Japanese Phonology: Homophones from Core Lists (complete) - iKnow!". iknow.jp. Retrieved 2017-11-22. ^ Steffen, James. "Tora, Tora, Tora." Turner Classic Movies. Retrieved: February 12, 2012. 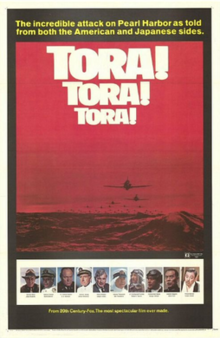 ^ "Tora, Tora, Tora (1970) Full credits." imdb. Retrieved: May 5, 2009. ^ Doane, Loran. "Historic P-40 aircraft returns to 'action' near Kawamura Gate." United States Arm, June 12, 2008. Retrieved: March 22, 2013. ^ a b Orriss 1984, pp. 194–195. ^ a b Galbraith 2002, p. 156. ^ Friis, Christian. "Tora! Tora! Tora!, Twentieth Century Fox, 1970". Pearl Harbor in the Movies, what to see..., November 5, 2002. Retrieved: May 5, 2009. ^ Galbraith, Stewart. "Stuart Galbraith IV interview of Richard Fleischer." Tora! Tora! Tora! DVD commentary. Los Angeles: 20th Century Fox Home Entertainment Inc., 2001, Time stamp: 26:17–27:47. ^ a b "DVD Playback: 'Tora! Tora! Tora!'." ASC Magazine, March 2012. Retrieved: January 19, 2013. ^ Hanson, David. "Artwork for ‘Tora! Tora! Tora!’". Dave's Warbirds, July 16, 2008. Retrieved: May 5, 2009. ^ "Tora! Tora! Tora!" Commemorative Air Force. Retrieved: February 12, 2012. ^ http://ww2f.com/threads/about-tora-tora-tora.16059/. Retrieved February 6, 2019. B-17G-110-VE, 44-85840, c/n 8749, the B-17 in question, was a converted water bomber that crashed fighting a forest fire in Nevada three years later. ^ https://en.wikipedia.org/wiki/Accidents_and_incidents_involving_the_Boeing_B-17_Flying_Fortress#1970s. Retrieved February 6, 2019. ^ Hathaway 1969, p. 52. ^ O'Hara 1969, p. 23. ^ Orris 1984, pp. 196–197. ^ Orriss 2014, p. 234. ^ "USS Yorktown ." patriotspoint.org. Retrieved: February 12, 2012. ^ Orriss 1984, p. 196. ^ Robertson 1961, pp. 160–161. ^ "Tora, Tora, Tora, Chapter 9." Archived 2013-06-05 at the Wayback Machine .usssavagededer386.org. Retrieved: May 18, 2013. ^ Storch, Paul S. "Conservation Treatment of the USS Ward forward gun: Minnesota State Capital Mall." Minnesota Historical Society, July 2006. Retrieved: February 12, 2012. ^ Carnes 1996, pp. 228–231. ^ "Introduction to Central Oahu." hawaiiforvisitors.com. Retrieved: February 12, 2012. ^ Safire, William (2008). Safire's Political Dictionary. Oxford University Press. p. 666. ISBN 0195343344. ^ "Flop! Flop! Flop! (Box office receipts of war film 'Tora! Tora! Tora!')." Variety. Retrieved: February 12, 2012. ^ "Tora! Tora! Tora! Domestic Box Office." The Numbers. Retrieved: February 12, 2012. ^ Parish 1990, p. 412. ^ "Tora! Tora! Tora!" dvdmoviecentral.com. Retrieved: February 12, 2012. ^ Ebert, Roger. "Tora! Tora! Tora! (review)" Chicago Sun-Times, October 12, 1970. Retrieved: April 1, 2008. ^ Canby, Vincent. "Tora! Tora! Tora! (1970)" The New York Times, September 24, 1970. Retrieved: August 27, 2011. ^ Variety staff. "Excerpt from the 1970 Variety review." Variety, January 1, 1970. Retrieved: April 1, 2008. ^ Berardinelli, James. "Tora, Tora, Tora." Movie Reviews. Retrieved: February 12, 2012. ^ a b Orriss 1984, p. 200. ^ a b Hardwick and Schnepf 1989, p. 62. ^ "Movie Reviews for 'Tora! Tora! Tora!'." Rotten Tomatoes. Retrieved: January 29, 2012. ^ "Binational Pearl Harbor." japanfocus. Retrieved: February 12, 2012. ^ Canby, Vincent. "Tora! Tora! Tora!" The New York Times, September 24, 1970. Retrieved: March 11, 2009. Agawa, Hiroyuki. The Reluctant Admiral: Yamamoto and the Imperial Navy. Tokyo: Kodansha International, 2000. ISBN 4-7700-2539-4. Galbraith, Stuart, IV. The Emperor and the Wolf: The Lives and Films of Akira Kurosawa and Toshiro Mifune. New York: Faber & Faber, Inc., 2002. ISBN 0-571-19982-8. Hathaway, John. "Tora! Tora! Tora!" Flying Review, Vol. 25, No. 3, July 1969. O'Hara, Bob. "Tora Tora Tora: A great historical flying film." Air Classics, Volume 6, No. 1, October 1969. Carnes, Mark C. "Tora! Tora! Tora!" Past Imperfect: History According to the Movies. New York: Holt, 1996. ISBN 978-0-8050-3760-9. Orriss, Bruce. When Hollywood Ruled the Skies: The Aviation Film Classics of World War II. Hawthorn, California: Aero Associates Inc., 2014, first edition 1984. ISBN 978-0-692-02985-5. Prange, Gordon. "Tora! Tora! Tora!" Reader's Digest, November 1963 and December 1963. Robertson, Bruce. Aircraft Camouflage and Markings, 1907-1954. London: Harleyford Publications, 1961. ISBN 978-0-8168-6355-6. Shinsato, Douglas and Tadanori Urabe. For That One Day: The Memoirs of Mitsuo Fuchida, Commander of the Attack on Pearl Harbor. Kamuela, Hawaii: eXperience, inc., 2011. ISBN 978-0-9846745-0-3. Thorsten, Marie and Geoffrey White. “Binational Pearl Harbor? : Tora! Tora! Tora! and the Fate of (Trans)national Memory.” The Asia-Pacific Journal: Japan Focus, December 27, 2010. Wikiquote has quotations related to: Tora! Tora! Tora! Wikimedia Commons has media related to Tora! Tora! Tora!.